We hope that all the readers will find in these conversations a lot of cognitive information. Roman: So let us start with a simple, what does the spirituality mean? Today under this concept, everyone means something different. Let us take the typical average person, me, for example. During many years, I go to church, donate to the temple, put candles, pray before the icons, to God, to various Holies and peacefully hope that the Lord has noticed my efforts to become spiritual. Imam: And what do you ask for? Why do you go there? Imam: And where is he? Imam: For that, you should put questions to the priests, whom you visit. Imam: Well look, father, spiritual father, confessor, and mentor. What do they teach? What is it? Does anyone tell about the Soul, about Spirituality? They say, "Yes, you are sinful; you must pray for forgiveness, you must..."
Roman: They tell about the salvation of the soul, yes, but they, in my opinion, do not understand what it is and how to save it. Imam: You should ask! Maybe because they are not asked, they do not tell. Maxim: Why? I asked them; put questions. They answer-you should pray, pray and everything will come to you. If you ask a precise question, then they answer that everything in prayer. That is, they do not have a revelation. Imam: Well, and what should be in the prayer? Have you asked this question to confessors? Oleg: The grace of God. In fact, many confessors really understand something, they say that a prayer is needed to be always present in the grace of God, in order to open up, and they say that prayer should be always, night and day.They have also mentioned these words "to appeal not only with words but also with feelings and heart." It is about the Jesus's prayer, by the way. Imam: Yes, those who understand something in this ... In the Jesus’s Prayer there is a concept - "to lower the mind in the heart." If we look attentively, we really lower our attention in the soul... But where is the Soul? Roman: I wonder if they know, in general, where is the soul? It is a question! Imam: This would be interesting to ask. Overall, there is an expression "a spiritual heart". It is usually said that the heart is the most spiritual organ, is it right. In principle, the physical heart is an organ that pumps blood. Well, the most spiritual, because it is the closest to the heart. And the soul is really in the center of the human. If we consider the human energy structure and in regard to the physical body, then it is the area of ​​the solar plexus. Imam: The real Jesus's Prayer is very interesting. First, a state of complete silence, that is mute silence or which is also known as hesychasm, is reached. The praying reaches a complete silence, as they now say, when he stops the internal dialogue. That is, he reaches that stage of relaxation of the physical body and control of the thoughts so that they do not disturb him. Then follows the expansion of consciousness and the praying expands his consciousness beyond the physical body, there comes a state of complete purity, inner light and wholehearted love to God. In the prayer, a human thanks God for the given opportunity of the spiritual transformation. And finally, the praying invites God to enter him and to make a spiritual creation. That is, the praying fully opens to God in Faith, makes his choice in favor of the spiritual world, renouncing sin. By the way, the confessors, elder monks of Athos monastery consider as a sin a perception of this material world as a real one. They claim that the Truth is beyond matter, it is in Spirit. Roman: Why is it not conveyed to the laity? Imam: It is in the writings of the elders. But the laity mostly do not look further than the New Testament. And many simply misread it. Or priests do not tell in full. And they tell only that what they have been taught. But a knowledge is an ongoing process. There are libraries in seminaries and other religious institutions, which store many interesting things. But not every desirous, even of the priests, is allowed there. It is only for trusted. Sergey: It seems to me that most of the laity do not work on themselves or shift the responsibility for their salvation on to others, is it so. They think in the following way: The Lord will save me, I will put a candle, the mons will pray for me. And there is no time to start and work on oneself, as they have to feed the children, and so on, just common excuses like secular stuff is for the laity and spiritual one is for priests. Roman: Well, with me it was different. I will again recall my experience, if you allow. I once showed an interest in the church, experienced the practices of confession, serious ones. I worked on myself, dissected my sins, sought out reviewing the past, and recorded everything, in order to say aloud at confession. I visited priests, became acquainted with them, tried to find out about God, about the structure of the world, but somehow I was not particularly interested for anybody with all my strivings to cognize God, do you understand? Is it the way it should be? Imam: In the past, there were parochial schools. Already since childhood, the children were already aware of the concepts such as “do not kill, do not steal, esteem and love one's neighbor”. Love your God and your parents. Those were Sunday schools. There was also an education. Because earlier the education was concentrated at monasteries and churches. Roman: Did the monasteries have the knowledge and the books? Imam: And in the middle Ages, all the scientific experiments were conducted there. Everything was under the aegis of the church. Why? It is, in principle, completely right on the one hand. Because science which is not based on morality conduces to the death of humanity. Well, we know many examples that people have created weapons and technologies, which destroy nature, our common home. If a human were completely moral, he would never have done it, considering where it could follow. And faith, it primarily supposes love. First, it is the love to God, to the people, as everyone has His particle- the Soul. We do know that God is one in the set. And if a scientist is not moral and does not feel the pain of others, he will lead to such a cataclysm from which the world may shudder. That, by the way, has been already. At that time, the principles of morality and ethics were laid to the man in childhood. And those who wanted to know more just went further and studied. Moreover, it is a self-work, right. Because by and large, if a Christian (we will consider Christianity as it is closer to our territories) studies everything that was written before him, studies deeply, he comes to understanding of the deepest feelings, good and happiness for everyone. Roman: Does he finally come? That is, does he start to work in the Spirit? Imam: Yes, he works in the Spirit, he perceives himself as a Spirit. Roman: Today in the society the concept of spirituality has been much substituted. Many people start to practice the increasingly popular yoga, Tai Chi, Qigong, various meditations, or after reading a couple of clever books such as Castaneda, become absorbed in psychedelic practices. Many of my friends, for example, addict to Vedic seminars, they listen to numerous audio lectures on how to optimize their actions in order to be bestowed the prosperity in earthly life by Gods ... And they believe that they have entered the spiritual path. Is it so? After all, if we look into, then everything is connected with the world of matter, and therefore, it is not spirituality, but just the opposite. Imam: That is right, with the loss by humanity the original knowledge of the Creator, of the Universe and the worlds created by Him, about the world we happened to exist, the concept of spirituality has been lost. The goals of our existence on this planet and the tasks set by the Creator before a human and humanity in general, have been distorted by a certain circle of persons and because of that, people currently do not have a clear and accurate direction of their evolutionary development, as a spiritual being. Such concept as a silver thread was hidden. That is, was hidden the knowledge that made it possible for humanity their further evolution. Therefore, on the remains of the knowledge which were left accessible to people, were created religions and various theosophy, magic and extrasensory trends which call themselves spiritual due to a lack of understanding. If you closely examine the abovementioned trend, it becomes clear that in these directions was studied influence on people as well as the work with the material and energy components of the human being, but it not relevant to the Spiritual world. The spiritual world is not material not in the least. The world of Creator cannot be perceived in any way by the human mind and consciousness by the reason that the death and the final are not able to understand infinity and timelessness. Roman: I will recall my experience again at the example of our friendly team, a group of like-minded people. We were such active guys practicing contact martial arts, reading all sorts of clever esoteric books, we attended workshops, intense trainings, saw various interesting people, clairvoyants, passing through gurus, we interacted a lot. And we were in some kind of pleasant illusion that we move in the right direction and develop spiritually. It was before appearance of the book "AllatRa" (it is not an advertisement but a simple statement of fact). Because the book put absolutely everything in its places, all the puzzles were fitted together. But if the book has not appeared, we would still have swam in a jungle of egocentrism, improvement of the physical body and consciousness. Again, there was not a real spirituality in our path, right? Imam: The path of spiritual development has both ends. One leads to the spiritual world, following this path a person really transforms oneself into an eternal spiritual being. The path in the opposite direction leads to the expansion of consciousness, but with the desires of the animal nature for power over others and the gratification of own pride and megalomania. In this case, the fundamental law of the freedom of choice of other people is violated. This is a way to nowhere, or rather the way for subpersonality. The human body is mortal, but the desire and aspiration of the person form a kind of information fingerprint (subpersonality). The subpersonality has no life program, however, it is a reasonable information bunch of Septon field, in which desires and aspirations of the former personality are stored and repeatedly increased, and they, in this state of already subpersonality, cannot be realized in any way, because there are no tools (body) already to do it. Both of them are the result of the choice of the personality, but there must be knowledge for the conditions of such choice. Such knowledge is set forth in the referred above book "AllatRa". The knowledge that has been introduced into this world by bodhisattva, the supreme being of the Spiritual world. The word bodhisattva came to us from the Hindu tradition; in Christianity, these creatures are called archangels. Imam: Let us return to the subject of church and parish schools. How the knowledge of the spirituality has begun to be gradually lost in the church? First, this kind of knowledge gives a human a true freedom, which is a freedom in the Spirit. Such a human cannot be manipulated or enslaved. Therefore, either this knowledge was intentionally closed somewhere or they just did not want to give it to such an extent that replaced it with the rites, and then forgot about it themselves in the course of time. Many books that contained the knowledge of the spiritual essence of a human and the ways of the spiritual transformation have been destroyed or become unavailable to most people. Then those who kept the remains of the knowledge are gone, and the new ones have not reached it. The knowledge was so deeply hidden. And the substitutions went through the centuries and the substitution has become a dogma. This dogma began to dominate. In practice, those who are called, in principle, to bear the spirituality, have lost the thread itself, that silver thread that must lead to the salvation of the soul. Imam: Yes, that is what we are talking. In principle, any nonsense that passes the test of centuries becomes almost a byword. Therefore, the truth is being lost. While many people were guided by feelings, even adhering to religious traditions. The true saints can be found in any religion: in Buddhism, in Islam and in Sufism. All this was. Again, only that people have attained a spiritual liberation who deeply studied their tradition, very deeply. But if we talk about the result, by and large, they all reached the same - the deepest feelings, a contact with the world of the Creator. What is called grace in Christianity? It is all about the same. In principle, deepest feelings, a contact with God through the Soul with the help of the Holy Spirit were meant. Roman: Is this, in general, the true spiritual path? It is not yoga, seminars or pilgrimages to "holy places", is not it? 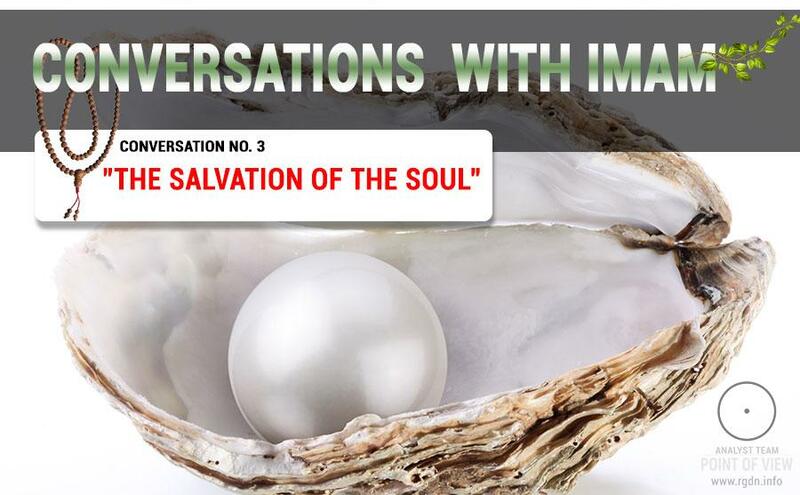 Imam: Yes, it is the cognition of the soul through the deepest feelings. Do you know what the essence is? When a person understands that he is not a body. He realizes, but cannot describe in words, because there is a difference in words. Yes, here there is a saying: "The uttered Truth is a lie." Why? Because the words cannot convey a spiritual experience, it is impossible to convey feelings. There are attempts. There are good attempts, in principle, to express the deepest feeling in words. Roman: Do you mean «Poem of the Sufi Way" by Al Farid? Imam: Yes, by the way, it is a wonderful poem, very deep, beautiful and poetic. Al Farid managed to express in poetic images his experience of the spiritual transformation, the stages of passing such a path. Although these works best be read in the original language. Roman: Is it due to the difficulties of translation? Imam: First of all, the difficulties of translation. Second, how to tell about the feelings? Look, they talk about love for centuries. Someone paints in a state of love, and these pictures are transformed into masterpieces. Someone writes beautiful music, expressing feelings through music. Someone does it by the words, in prose. We can take everything as an example. A blacksmith forges thing of good quality, he does it in the state. And people may perceive the result of creation. Virtually any activity in a state of profound feelings of joy and creativity is transmitted to other people, and they, by watching this creation experience a similar feeling. This state is laid in the matter, in any material object. We talk about feelings. The person was in a state to co-Create something. The word "Co-Create" itself, yes. It means that he has done it not alone but jointly. That is, the body and the mind become an instrument to convey divine. That is, the Creator through the person in feelings is trying to convey what the state of the Spirit is. Open Spirit. God is the one who has generally created the whole world. No one cannot do anything more beautiful than He has done. The human, when opens, he completely forgets about himself. Whomever you take, a scientist, a poet or an artist, it is not important. He says that he does not know how he has done it. That is, at that particular moment his mind was switched off. Imam: Yes, the inspiration! This is a state of the Spirit, which the Creator has breathed in. The human has opened in feelings and he is out of consciousness. The consciousness does not perceive and does not fix the act of spiritual creation. Imam: That they are up to. (Said with a grin). You mean the conventional contemporary art. A human undertakes the function of the Creator, claiming from the pride that he is the one who creates. Roman: So, he is already the guide of not spiritual, but vice versa. Imam: Naturally. When he is in pride, what kind of spirituality it is? And whose favorite sin the pride is? Of Satan. Yes, it is vanity, pride. Roman: And creative work for earning money is from Satan? Imam: Yes, you know, it is already secondary- to earn money. A human gets more satisfaction from the fact how he will be perceived, desired and praised, that is, he wants to appear spiritual or creator. In other words, to put himself and his ego above. He can even not eat enough, not sleep enough, experience difficulties, but his pride is great. Al Farid has very beautiful phrase: "If poverty is proud of itself then it is vanity again". He may be poor, but so proud and tells how great he is. Roman: I live in the dugout, but write poetry? I go in the pants full of holes, but draw beautifully? Imam: Yes, but he has not been recognized. Although it may be a delusion of sick imagination. Roman: But it can also warm somehow? Even he is not lucky in life, but what a picture he painted yesterday! He drank a little bit and got an inspiration. He looks at it all day, admiring. Is it also substitution? Imam: Yes, of course, it is substitution. Because there is no Spirit there. He puts his ego above the Creator. He never gets a masterpiece. When a person is becoming a spiritual guide, then in the work, which appeared from under his hand or the pen, the state of inspiration was laid. Roman: Does the human lay something in his creation? Imam: He does not lay anything, he just opens. The Creator creates through him. Roman: So, initially is it his choice - to open? Imam: Without it, nothing will happen. The state of the Spirit, the inspiration. A human has opened; something in this world is manifested. It is filled with this deepest inner feeling experienced by him. The second dimension, the plane. A picture is created on the plane. A poem or a work are written by signs. Even though we are well familiar with these words, these letters, but they are composed in such a way and in such a feeling that we perceive it as a masterpiece. Why? Because a human conveys his state at the level of feelings. Roman: Which dimension a level of feelings is? Imam: It is already the seventh dimension. Roman: The seventh, yes? Interesting! Imam: Look, we read "AllatRa", or books by Anastasia Novykh. A hundred times we have read the same text, but continue to make our own discoveries, we find something new that had not previously noticed. Books are written in the way that the information is raised layer by layer according to reader's awareness. Roman: Whereas I also noticed when you perceive it as an uneducated caretaker, you see one. When you have worked on yourself a little bit, you see already something different, further - the third. It looks as if it depends on the spiritual experience. Imam: Experience and understanding. You are transforming. What happens? You get the information and start to work with it profoundly. Finally, you come to the feelings. Again, you begin to re-read. You raise a new layer of information. Roman: How interesting! And the question is: having reached the seventh dimension, whether it is possible to perceive the book "AllatRa" as an effective manual for further cognition of the spiritual world? Imam: Of course... This is the same silver thread, which leads to spirituality. Again, what spirituality is? It is a link. It is a connection of the Personality with God through the Soul. Here it is a spiritual link; it is this contact, a co-sacrament. A merging with the Creator. And it is not matter. Roman: Well, what we are talking about is the ideal. But let's go back to the simple examples in order to make it more understandable to ordinary people, who have not known yet the subtleties of the spiritual path. A Christian church calls its followers to a common practice - a prayer. At home, I have a Prayer at the bookshelf. It is a book of more than 500 pages. It includes Orthodox prayers for all occasions. Here are recipes from everything - from hiccup and shipwrecks, baldness and headache, against robbers, thieves, and even from death, prayers for a successful trade, for sale of the apartment, for study and for finding a job, for pregnancy, love and for the fulfillment of wishes. The prayer before the trip and even before the food ... It is a full miraculous set. If we look into the matter then what is it if not a magic guide? And it is not only welcomed and encouraged but even imposed. Once I have heard an interview of a well-known preacher in Russia, who said that in prayer we should ask God about everything, almost: Bless, O Lord, to the delicious fried potatoes. Or let us take blessings. Bless me to start a new business, bless me to pass exams successfully, bless me to have a good deal and so on. Probably all of those present have carefully read PRIMORDIAL ALLATRA PHYSICS. What it is? In reality, it is the work in the system, the request for matter from matter, for Septon field- from Septon field. The real magic, right? Is there a spirituality here, a silly question? Julia: People do not realize that it's magic! Roman: That is why we are talking about it, trying to get down to the bottom. People think,” I went to church, prayed for the health of my grandmother, my grandfather, put a candle and wrote a little note - a "minimum" spiritual program is fulfilled”. Maxim: Do not understand, because they have to be shown that asking for the matter, they will get matter not spirituality. Roman: Let us talk about this. This, I think, a very important delusion. If we take the same prayers, what it is? Magic set of symbols, right. We do not blame anyone; we just try to understand. Imam: What people have been taught, that happens. Roman: So, the modern concept of Christian prayer is directed to the multiplication of matter, if to get to the bottom, right. Imam: They have not been taught that there is true forgiveness. Why? And a human is not taught that there is another world. It is mentioned in the teaching that you will get then, in the afterlife. Somewhere out there, there is a spiritual world, but it is somewhere out there, beyond the grave, there you will pass judgment, test and get either reward or punishment. And what's going on here at present? And what about the responsibility for the thoughts and actions? Imam: First, we are now appealing to the law of cause and effect. The human does not realize that he is bearing the responsibility now. As a rule, he shifts the responsibility on someone else, finds a "scapegoat», he is looking for the guilty ones, someone bad who is treating him unfairly. And that what he let out to the world? It came back to him. He does not understand it. Does not he feel? Yes, he feels! Of course, he feels that he does something not right. He feels that something is wrong, the conscience made him understand it. Let it tells him quietly during the day, but in the evening it does it louder. Roman: And at night even louder. Roman: But I get back again to prayer. Let's take one more clarifying and intelligible example: here I am so busy-businesslike, but I consider myself a believer, I go regularly to church, twice a week, pray, put a candle, I am looking so sincerely at the icons, I donate alms, asking for the health of my loved ones. In fact, everybody is asking for health! I ask for, as it is in trend today, the prosperity of the nation, well, as a patriot, what is bad about it? Everyone is asking, and I am asking. I pray for Ukraine. For the well-being of the state. What is it, in fact? Imam: The same (with a smile). Imam: There is a personal interest in it. Even if the person says and thinks that he is spiritual, that he is a believer, what is happening? He again puts himself – he puts” I”. It is interesting, just think about it: he does everything right, he gives alms, he performs all the rites, confesses, and tells to himself - I am spiritual now. What is he doing? He puts himself above others. Roman: Well, I will put the question in other way. He does all this and entertains the thought that this is enough. Roman: For the salvation of the Soul! Imam: I will repeat again, he still separates himself from the others. And any separation, from whom it comes? Imam: He puts hierarchs above oneself, extolling them as guru ... hierarch of the Church, teacher, master, and so on. Wherever he would go, he will always put himself below. However, to those who are less enlightened in his issue, he, just note, will already put himself above. This way or that, in any case, it is a substitution. Roman: Anyway, in this case he will not succeed in anything, will he? Imam: Yes. In the spiritual world, everyone is equal. There is no separation there. Sergey: Such spirituality is synonymous with ostentation. Maxim: The human was taught so. Roman: Yes, a human was taught so. However, how to explain to the majority that it is not enough? That this is the wrong direction. Imam: It is not enough, first, but the human is too lazy to look for. My opinion is, a human was taught the alphabet, he learned to read, and he believes that has already perceived everything. Although there is quantum physics, higher dimensions, etc. Roman: But his spiritual father shouts that it is all from evil! Imam: I agree, for them it is easier to say, you would better not go here, not be wise - this is from evil. Sorry, but if I want to know, and I know that in this teaching there were those who went further, why not to go deeper? Find that Truth that unites everyone. The man himself must strive to cognize. And if he was said -pray. It is good. But he does not find something, he is short of something. Why do people go from one church to another? Many people go; many are looking for. They feel that something is missing. Imam: That is possible. But this, I am sorry, the consumer attitude, own laziness, like I will come, pay and someone will give me something. But what is offered instead of spirituality? "Super abilities" or an illusion of those. Sergey: It is also a moment of freebies, which does not exist in principle. Imam: I will come and I will do everything what they say in order to get something. Yes, this does not happen! We always pay for these "super abilities", but it is a pity that human does not understand by means of which. And this attention - that force of creation, which is given to us for our spiritual transformation. Sergei: And in addition, he shifts his work at the priest? Sergey: Any sect is based on this. Roman: Yes, and the church is based on this! Sergey: The Church is not a sect, is it? Imam: In fact, any system that exists, it is based on three things: a miracle, mystery and authority. So what do we have? The church is based entirely: The miracle of the Resurrection. Mystery - how it all happens. And authority - there is someone to whom everybody refers and that is all ... do not push in further, the path is closed. Well, take the writing, take the same New Testament, and just get a grasp carefully. What does Jesus say? Although there are very few words of Jesus there. Mainly, where he went, what he did, and what came out of it. And the words themselves are very few for some reason. We read in one verse: disciples came to Jesus and say: How should we pray? He answers them: enter your room and pray like this: Our Father in heaven... yes? And further we read, the prayer goes: Our Father- Hallowed be your Name, Your Kingdom come, your Will be done ... (Lk. 11: 2-4) That is, again, an indication - A human does not have his will! There is only the will of the Creator. Maxim: I have just recently read the Gospel of Dionysius, where Jesus said, "Yes, I will destroy the churches which were built by priests and will erect new ones in three days." They asked him, how you can build a church in three days when these churches have been built during 50-60 years? He says, «The Truth is not in the external, but in the internal. The church should be built inside, but not outside. " Imam: But if you carefully ponder over the words, then, strictly speaking, nothing prevents a person. In three days term, and why? Because when a human has accepted his final choice - that is all, nothing more is needed. He has made the final choice. What is the true choice? We have heard it in the programs. The true choice then occurs when a person has no doubts, there is no future, no past, and there is only pure action. He has made a decision; he does not need anything else. Well, if we take the internal - it is clear. Here is an example: a human wants to drink or Mother Nature calls him, is he sitting and telling about this? No! He is pouring the water and he drinks it. That is all; he has made a choice. He does not think about it - how he will do it. He has no desire ... He does not think about what kind of water is, he has a desire to slake his thirst. The can consider the same for the spiritual. If a person has made his final choice, he would not tell about it. He has a pure action. All. Therefore, in three days term. What? Understanding, acceptance and action. There is a knowledge, there is a made decision and pure action. That is all. And he does not need anything more. Everything that people say about their following the spiritual path is just conversations. It is necessary to make the final decision and close the doors of this world, but it does not mean the death of the body but the control of the Animal nature in human, his thoughts and emotions. He has stepped across the threshold, and that is all.You remember as it is said in the parable, when you stay at a crossroads - here is a temple next to you and a supermarket. Yes, the temple is open, there is nobody there, and nobody beckons in, but light is there, the Truth is there, the Love is there. And here is an old man, a shill, with a ratchet, loudly attracting attention, saying, "Come in, look how many interesting, you are welcome". And the man comes in. He could enter the temple, but he showed an interest, turned his attention…he started from a supermarket, so beautiful, bright, different toys, and various goods. Well, he still sees the temple through the shop window and thinks that he will stay here a bit and will come back, and go to the temple. But here is interesting for him. He takes a step, another step, and already he does not see the temple due to show-window, he wanders among the shelves with colorful toys, forgetting about the time given. And exit is always through the cash-desk. It cannot be in other way. If a person clings to something in this world, if something attracts his attention, he is definitely spends something on it. It does not happen otherwise. We all know how quickly attention draws away. We all see how quickly this happens. We see death around us, illness, anything you like. Where does it come from? From where? It happens because if a person with consciousness, then everything attracts it. The human again spends on it his forces, first his spiritual forces. After all, a human is given a try of life. But when passing through it ... a person gets the opportunity to enter the eternal, but he wastes it, simply dissipates into nothing. He squanders it on the external. But the Truth cannot be temporary. Life cannot be finite. Life continues - it cannot end. Never happens that it ceased. Something that ceased is existence, this is an illusion, and it is temporary. It exists now, but after some time it will reduce to dust, to ashes, it will not be. Roman: But today it seems for a human that he is a good, he consciously ceased doing bad deeds, he hung an icon at home, and he has a cross on his chest and quietly rejoices that became a believer. He has memorized a prayer, reads it before going to bed. Why do I come back to this again? Because people think that this is enough. It is misunderstanding of spirituality, and it is, in my view, everywhere. He came to the church, wrote a note, he sanctified a car. Sergey: More often than children people sanctify cars. Imam: Will it be better to ride? Imam: Statistics tells completely different... Remember the words in the same writing: whoever you were, whatever you have reached, but if you do not have love, true love, then you have not reached anything. Whatever you did, however you prayed, no matter how many crosses you would not wear, if inside you do not have love for your neighbor, then you have not reached anything. Roman: Is this the true meaning of spirituality? Imam: Yes. Moreover, this love does not depend on anyone. Remember the conception of love, which is described there, it is absolute love. "Love suffers long and it is kind; love does not envy; love does not parade itself, is not puffed up; does not behave rudely, does not seek its own, is not provoked, thinks no evil; does not rejoice in iniquity, but rejoices in the truth; bears all things, believes all things, hopes all things, endures all things ". (gospel 1 Corinthians 13: 4-7). Roman: Okay, but I'll go back again ... there is a common pattern: A man has a Saint, Saint Nicholas, for example, he believes in him, thinks that he helps him and ... he asks him: "Saint.. Pray for me to the Lord!" How it is called? Imam: This is called," Do not make yourself an idol". Roman: Indeed! The next question- I have heard that if a person has spiritually liberated and has entered the spiritual world, or seventh dimension, has become a real saint, but not "canonized" by the Church, then he cannot affect our three-dimensional world, or in other words, he is not here simply. And in principle there is no use in asking him. Is it so? Imam: In our world, at the request of parishioners, saints do not come, they are at the service of the Lord, and only with his permission, and they may sometimes attend this world. Roman: A desire, a dream, an idea? Imam: No, it is placebo effect. Imam: No, he believes. His mind, his attention, his principles are focused on this. He creates for himself some kind of essence, thought form, it is not important. But what he is asking about? Roman: About the matter, I suppose. Imam: And he gets the material. The system, you are welcome, it is arranged so, it makes wishes come true. But by what the person is paying? Sergey: Do you want to say that it is implicit faith? Imam: Yes. On the one hand, it is implicit faith, on the other hand, to which does he refer? Roman: Just another work of the devil system, right? Imam: Of course! It seems as if people appeal to the spiritual, but in fact, they appeal to the matter. Asking for the material, whom do you ask? To the one who it fulfils. Sorry, but the Spiritual world does not care what happens here in the matter. Do we pay attention to what are the worms in the toilet eating? How do they copulate with each other, reproduce their kind and so on. We do not care about it at all. The spiritual world does not see a human unless he begins to open, unless a spark ignites in him. Sergey: Okay, another question. Is it normal if a person has created a thought-form of the Saint and asks not for matter, but for the salvation? Imam: For the salvation of what? Imam: Excuse me, how does he do it? If the request goes through the deepest feelings, then the Spiritual world responds to it, but for your understanding, not some specific saint, because there are no images there. Roman: And if the request goes through the mind? About the salvation of the soul. For example, a human does not know how to do it, and asks for it by the mind. Can he be heard? Imam: And why do we tell it? When a person asks for something, and he is in a state of deep feeling, then the deepest reveals itself, the sincerity. Look, very often people immerse in prayer so deep, in such a contact ...he stays and he does not realize what is happening to him. The consciousness is turned off, the feelings are going. His eyes are full of tears. He does not see it and he does not notice it. Then when he goes back from this state, he does not remember what happened to him. He was carried away by something lofty in these seconds or minutes. Sergey: The prayer is sincere when a person completely forgets about himself. Sergey: He dies for this world. Imam: Yes. His mind is turned off, there are only feelings. Imam: If it is the request for the matter, it is clearly an appeal to septon field, an appeal to the system of this world, an appeal to the devil. By and large, if we are talking about the spiritual world, we are talking about the Spirit, does the Spirit need something material? Roman: What the spiritual world can be asked for? Imam: Only for the salvation of own soul. That is all! The Spirit does not need anything, as it has no body. Roman: Well, if a person has many troubles, difficult situation, can he ask for being strengthened from the inside? Roman: Well, for example, let's say, there is a negative pressure from the outside, the person is already a little bit aware how everything is organized, he realizes that there is a pressure, can he ask for the stronger flow from the Soul to be strengthened? Imam: Yes, he can ask for the strengthening, in order he could fulfil his work. He does not ask to do the work for him, he can ask for being strengthened in order to withstand in this situation, that is, be able to do this work himself. The Personality in human is a part of the Holy Spirit. If he has opened, what is more, he opens in prayer. When he opens, he gets the strength in order to overcome the present situation. He is not asking to do it for himself. Roman: So, it turns out, that all these requests to, supposedly God, for health, prosperity, for solving problems, about family and relatives and so on. - It is all from the field of "demonology". Imam: That is right. Look, when a person just opens in the spirit, he is strengthened in spirit, he does not need anything material, but all material issues are resolved. Why? He ceases to apply, what happens- the system keeps the human on the hook as long as he gives it his attention. As soon as he appeals to the Spiritual, he turns away from the problem, he does not care about it, and for him this spiritual feeling is important. What happens? He stops feeding the system; he ceases to nourish the situation, which prevails over him. And it is resolved due to the fact that it does not have its own life, it lives only by our attention. And the man, as soon as turns away from the problem, he goes into the spiritual, he strengthens this spiritual in him. His power goes to the intangible and the situation that he fed with his attention, just disappears. Roman: In other words, to make it simpler, we can say that if we do not want something bad, first, we should not think about bad. Imam: You cease to nourish the situation with your attention. The less emotions you spend on any problem, the faster it is resolved. Sergey: A fear does not allow a human to go further, it turns out that a human is kept by the system by means of fear. That is, a person has some problem and instead of being strengthened in the spirit, he nourishes it but why? Because he is not in the spirit, he is afraid that the problem will not be resolved. Imam: But now look, it is interesting, "I cannot do it" who says this? Roman: This is a topic for another discussion! Sergey: It may not to be out of place to mention in this conversation that people are asking for the salvation of their Soul. All prayers are constructed on the salvation of one's soul. Roman: And do they understand? Imam: Let us differentiate a little bit, The Soul is a particle of God, a particle of the spiritual world, it cannot die, but the matter is that the Personality is the one who is saved. Maxim: In addition, the Bible says about Love, about Love for one's neighbor. Now we assume that people did not read the Bible. But when you come, tell them, bring them knowledge, like in our example - if ask, then only for the soul's salvation, if feel, then only with the deepest feelings. Not to ask about the material. People, well, they do not hear you, and if you even refer to the Bible where it is said about love for one's neighbor, they do not want to hear you also. They do not accept it, just reject. All of them have read the book, they accept, but selectively, this I accept, but that I do not. Roman: The matter is perhaps in fact that a human lives by the consciousness and it filters. These are two opposing parties - the mind and the feelings. The consciousness, let us say, is life in the devil, but feelings mean life in God. Just in general. Imam: In general. Just look what happens, the human does not accept all the knowledge and chooses what is profitable for him, and this already means a personal interest. Firstly, the consciousness, and secondly, that dogma, which he accepts. He is satisfied with the paraphrase of another person, who has passed through his consciousness some knowledge, writing or teaching. Imam: It is like a spoiled phone, as we used to play in childhood, it turns out that from generation to generation that information is passed which was only understood by human, but did he understand the essence of the teaching which Jesus brought or Muhammad (peace be upon him), or someone else? Again, why substitutions occur? Because everyone interprets it in his own way, from the consciousness. And people who do not want to understand themselves, are content with those remains that someone there understood in his own way. In addition, they even argue among themselves who got it right. From the consciousness. Look, there is one teaching, but it is divided into hundreds of understandings. As many people there are, so many understandings and demons are. Therefore, a person who does not understand himself starts to accept someone’s point of view. Then he stumbles across another point of view and he realizes that they contradict each other or he starts searching for something new. Roman: Or to believe implicitly. Imam: Yes, and they follow the next one, that is why, due to the ignorance, people plunge from side to side. There is faith, but there is no personal experience. Sergey: As it is said, faith begets knowledge, the knowledge begets action, the action begets experience and experience strengthens faith. Imam: Then it is becoming not faith, but knowledge, True Faith. Do you remember what Jesus answered when he someone told him, «I will see and I will believe"? He said, "If you believe then you will see." But then again, you will see yourself; you will get your own experience. You will be strengthened in faith; it will be the true faith, the true knowledge. Because you acquired it yourself. You have experience, and no one will be able to dissuade you in it, because you have your own experience and your own knowledge. You have experienced with you own feelings that what you have heard and you have a personal experience. The experience of the personality and this is already valuable. Roman: Let us try to emphasize it somehow, to identify more clearly and intelligibly that the true spirituality is the work in spirit, in nurturing the feelings, but never in the consciousness. As soon as human switches to the consciousness, that is already not spirituality. Do I get it right? I will give one more example, I met a friend, he is sharing the joy - he was on Mount Athos! - I ask him, «And why you went there?" He answers, «Well, to join». And what further... They sit and drink cognac; next summer will go again. Do you understand? And there are a lot of the same. And people think, that they went to Mount Athos, that is all, it certainly will be counted. That is why, probably, it is very important to draw a border here: the spirituality is the work only in spirit, out of the consciousness; this work is out of the matter, its dogmas, rites, rituals, stereotypes, and such like. This is the feelings, the work to cognize these feelings, to cognize Love. But there is no place for consciousness here. Is it possible to say so? Although ... through the consciousness God probably also can be learned? Roman: You are already guided by the feelings. Imam: Yes, here you very correctly noticed about the feelings - you are guided. You are guided by that deep feeling and it is intensifying. Imam: This will starts to act in you. Figuratively speaking, a human is like a glass, if he wipes this glass, it becomes lighter and more sunlight gets through it. He becomes cleaner and brighter, every time purifying himself from evil thoughts, from some desires. Roman: And at the same time, moving aside from the consciousness, is it right? Imam: So he rubs the glass, he washes it clean. Sergei: And there comes a time when the glass disappears because it is not visible. Imam: Yes, it becomes so clean that the shadow disappears. Roman: It is not possible to get rid of consciousness completely, it is a toll to cognize this world, to interact with it? Imam: Yes, we cognize this world through the consciousness, but this world is not the only one. And the three-dimensionality is only a small part of what God has created. We believe that the universe is so huge but, in fact, the universe is so fragile and so small compared to what is real. The world does not stop its existence on the three-dimensionality, and if a human immerses more into feelings, his perception becomes wider and stronger. The human has knowledge, he has a sensibility, and that is, he perceives not only in a small three-dimensional spectrum, he starts to perceive a much wider spectrum. Roman: But he does it not by mind and not by consciousness already, right? Imam: Of course. The cognition goes by the organs of sense: (eye) sight, hearing, smell, tactile sensitivity, and so on. Again, when we start to cognize through the feelings, there is the concept of intuitive knowledge; it appears regardless of logical thinking. You simply know that it is so. Maxim: Is the simultaneous co-existence of the consciousness and feelings (in parallel) possible or these things replacing each other? Imam: First, when the consciousness is used only as a tool, it starts to serve you, but not you serve him. Look, the animal nature in the human is a part of the animal mind. Through it, the animal mind consumes life. But what do we have here, we cognize this world through the consciousness, but it requires attention from us - that force that manifests some material object. We study it, giving our attention to it that is why we see it. How does it work? We do not think about the subject, to what our attention is paid, we do not even know it. Why? Because no our attention is there. Therefore, the system does not show it to us, it has not manifested in our consciousness, we have not paid attention there. The world is organized in a different way than we think. For the subject or phenomenon or event or a person to be manifested in this world we have to draw our attention to it. We have thought about the human - and he called us, we have remembered about him, recalled his image, how he looks like. And usually he appears in our mind in the way we remember him, how he looked like and in what was dressed. We remember referring to the past. Now he may be sitting at home, in a bathrobe, but we remember him on the beach, in the car and so on. We refer to that image to which our attention is paid and we see either an object, or something, again, where our attention is drawn. If there is no our attention then there is no septon field. Largely, the whole world is made up of septon field, the image is being formed, the elementary particles are being made up, and the interaction appears between them and so on. This is physics. If there is no our attention there - it is emptiness. We have feelings, have an intuitive knowledge, but we convert it into images familiar to us. We do not cognize differently in the three-dimensional world; it necessarily comes to us either by words or by thoughts or images. So if there are feelings, then there is an understanding, yes, it is so. But when we go into spirituality, not paying attention to the three-dimensionality, the image disappears, there are no images there. Because there is no septon field there, everything is different there. Something that we call anti-matter, that is, there is no matter there. There is nothing to form an image from, there are only feelings, just feelings, this is something what creates a wave, the wave creates small septon, and small septon creates an elementary particle and so on according to physics. There is no image there; they cannot be there. There are the deepest feelings there and the farther you go, the more it opens. This is such immensity that the mind almost cannot believe in it, because it does not have an experience of cognition. The finite mind cannot comprehend the infinite. It just stops functioning when we do a spiritual practice, when we by our experience go into the spiritual, into feelings. The mind cannot understand it, you get out of practice and you do not realize where you were and what happened to you. Why? It does not have a cognition experience and it cannot cognize that what is unable to do. Maxim: But originally, our attention is directed to the feelings. Imam: But it is already the movement of the spirit. Roman: Another question, the temples have been built for centuries and, as I understand, it was done for particular reason; they have to “work” in a different way, strengthening in human only positive qualities, intensifying sensitivity. What do you need to make it working again? How to return Love to the temples? Imam: Knowledge and Love. Through the knowledge, we start to cognize with deepest feelings. The Knowledge of how to reach the deepest feelings, that is this state of contact with the spiritual world. The priest must teach the person how to come to the spiritual world. And for that he should know himself what means to be constantly in touch with the spiritual world. For that he serves through the feelings the spiritual world, he serves God! Imam: You are right. Where there is knowledge, there are also symbols and signs that activate in the human the positive, the spiritual. If a human comes to the temple, if you look closely, then there are always some signs, some symbols in it. Even any icon painting brings a symbolism. Lamb is considered as a symbol of the sacrifice, but what is sacrificed- the Animal nature, a sacrificial animal. And it tells about the human's component, that in human there are the Animal nature and the Spiritual nature. In order to come to the spiritual world, it is necessary to sacrifice the Animal nature, that from creature, his ego. Roman: Is this the true spiritual path? Imam: Naturally. If you bring in your life something new then you have to get rid of something, because life is always full, it cannot be somewhere empty; the emptiness is always being filled with something. If we want to come to the spiritual, then we have to get rid of the animal in ourselves. This is one of the steps of bringing the spiritual into your life: in order to step into the spiritual world we have to renounce the animal, the attachment to the material world. Roman: An outsider can read and say, "How it is to renounce the material world?" He cannot understand what benefits he will receive in return. It is clear that he lives by the consciousness. Perhaps the person has to be convinced somehow. Imam: Often there is a substitution how to renounce the material; people start selling their belongings, houses, apartments, everything that they have acquired believing that in such a way they can return to the spiritual. But these are also substitutions, the attitude to what is surrounding you is important. If you have an attitude to things as to available means for temporary dwelling, then they help you to fulfil the task, to make everyday life easier. You have time to appeal to your inner, to the most important. When these things do not prevent, but help to fulfil this task, so let them be, it is out of question. Everything is in attitude to these material things that you have. If we do not consider them our property and do not cling to them, they just exist and help us to fulfil our task. At least they do not prevent us. Imam: You do not sleep in the open air; do not freeze in winter in a cave as an ascetic. Does the person come to the spiritual through destitution? Whatever ascetic practices a human has not done, if he has no deepest feeling he will go in the wrong direction. Largely, it will lead to nowhere. As for today, many people consider a spiritual feat if they crawl on their hands and knees a few miles. Imam: Not only did attract attention, but also live off alms. That is, they almost live as a parasite, they do not produce food or create clothing, people bring them donations and they consider it natural to live off others. Roman: Here we touch upon the issue of guru, preachers and teachers, is it right? Imam: Yes, but why he has become a guru? He crawled on his hands and knees hundred miles, returned, said that he had performed a spiritual feat, and now others should worship him and he would teach them. And he becomes a guru, teacher, sorry, what kind of teacher is he? Not only that, he lived at the expense of others, and now he even tries to teach something, that he cannot do. Again, he teaches others to stand on their hands, knees, and crawl, or to perform some rituals, external actions. I am sorry, but where is the deepest, where are the feelings, and where is the attitude towards one's neighbor as to oneself? If someone starts to separate himself from others and say that he is superior to them, that is all, I am sorry, but he already serves another. You cannot serve two masters at the same time, it is impossible to serve owns pride and the spiritual world at the same time. Roman: There is such a notion, I went through initiation, and I got some degree. Sergey: A few days ago, I conversed how Osho was asked. Imam: Twelve miles he crawled on his hands and knees in the memory of his teacher, he performed a spiritual feat. They say that spiritual feat is when someone labored, lived in a cave, did not eat enough, and fasted for a long time. What he acquired through this fast, what does the fast mean? Imam: What I would like to say, how to find love? How? There are several steps to this; a person cannot understand at once, what it is. There is the mass of obstacles on his way to the Love, and they are his own - the consciousness confronts him. Roman: Is it the consciousness that asks why I should cultivate love in the aggressive world? The first counteraction? Imam: But again, if a human has wondered how to find love, it means he has an inner need, he already has the first impulse, and there is a need to gain this quality. Roman: But if not, if he understands it by a piece of brain, then how to persuade? Imam: Look at the people who have already passed this way. They are quiet, there are no conflicts in their lives, and as a result, a human feels good. It is like a side effect of what is happening to him, what kind of changes occur internally. Roman: Well, we will change the question a bit; people probably have some misunderstanding: either to have spirituality, or to earn money, as they have to earn their living! But how I will strive for God and at the same time continue to spin like a squirrel in a financial wheel? Imam: But the person needs less, he is satisfied with what he has, and when it happens, he does not spend more than it is required. It means he already has a well-being. Roman: Are you about the state of inner peace? Imam: Yes. But to a large extent, a human strives for this state of happiness, it is internal state, but when it happens? Here lies the substitution - a human thinks, I will be happy when I have this, this and that. When there will be this human next to me, within the walls that I will buy or build - it is a substitution. He is looking for this state, but when acquired, he realizes that he was deceived again. Why? Because he is looking for in the external but not in the internal. Here, when a person comes into a state of love, of peace, he resumes relationships with other people. Roman: We are now talking about the true spirituality. Imam: Yes, the person has that moment when he starts to feel the inner peace. It is the state of stable inner peace; it is the inner state of happiness. And when does it happen? When a human fulfils those tasks, which were originally set by the Creator. There are laws of the spiritual world. If a human lives in accordance with these laws, lives by conscience, it comes to him. The moment when a person lives according to conscience, lives by honor, understands another person, and lives by feelings. He understands that another person just like him has the same qualities, has the same Soul. He starts to feel. And he cannot treat another person in the way that he would not want to be treated himself. He cannot do harm to him, because he feels. Roman: And the amount of troubles and problems become less in life? Can we add this to the advantages of spirituality? Imam: In general, why all the troubles in life occur? Because of misunderstanding. There are different points of view and everyone is trying to prove his own one. Roman: It comes from the consciousness, it is devilish system again ... Let's try to split in such a way: the consciousness will be on the one hand - on the other hand will be feelings; on the one hand will be problems and troubles, the rush and bustle - and on the other hand will be another world, well-being and comfort. Finally, on the one hand will be the coffin and subpersonality, torment during life and after death - and on the other hand will be a completely different layout, happiness during life and happiness after death, eternity. In my opinion, that is convincing. Sergey: What is the first step for a human to make? Imam: Look from what it starts, how does a man start to acquire this state of spirituality? First, he should stop envying, should get rid of envy, stop censuring. Roman: He does it by his consciousness. Imam: Yes. At least to stop censuring a human. There are lot of problems from censure; these are envy and hatred, although it is the same. An estimation is again a judgement, although any judgement comes from ignorance, a human does not know how the other one has acquired the first thing, the second, the third, but he starts to judge him, if he only knew what happened in that man, he would not have envied. Next step is to stop hating. It is very difficult for a man to get rid of judgement, estimation, it is such a tenacious, sticky thing, and it is a pattern. This, again, relates to pride, he is like this, but I am like that- again a comparison. Gradually when the person ceases to judge, he starts to treat the other person as he is. Yes, he may be not like us in something, maybe we do not like him, but again, it is our estimation, it is our attention. The human for some reason focuses his attention on the bad qualities of the other person, thus he either strengthens them or perceives them so seeing only bad in a person, but why not to learn to see the good in people. After all, in every human there is something normal. In some situations, he really acts as a human. Roman: There are no bad people? 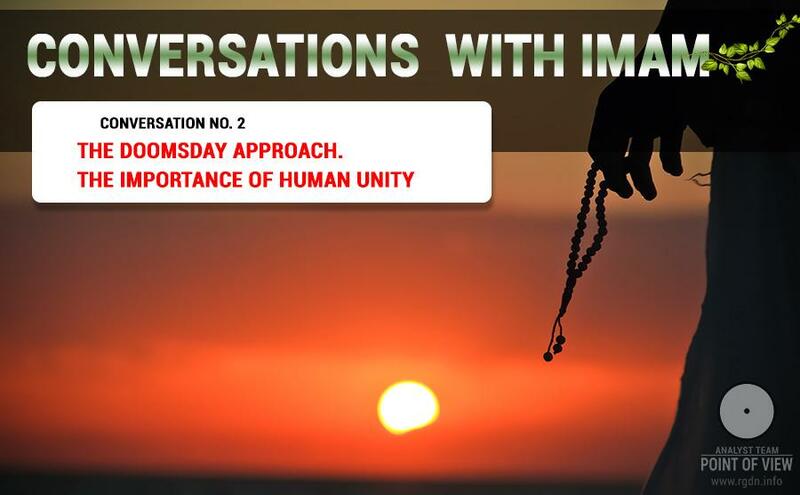 Imam: Find the good in a human, start to communicate with him as with a human. Roman: Or at least try to see the good in people? Imam: It goes without saying. You will see so much and gain a lot of positive. The human changes. The human changes when we see the good in him. We change our consciousness, because we see differently. We acquire the ability to perceive with feelings. And here comes the next step-to understand another person, to feel him, and finally to love him. Imam: Yes, we, by our attention, strengthen good attitude towards him in ourselves, and in accordance with the principle of the unity of the whole world, strengthen good feelings in him, the desire to do something good. Maxim: Do we start the process itself by our attention? Imam: And taking into account that we are united, God is one in a set, and every person has this good. It is interaction, but there is no and cannot be a personal interest. And the human interacts with you in a kind way. This interaction does create unity. Everyone, opening in feelings, opening in Love, strengthens the Spiritual in oneself. It should be noted here that a human is only a guide of will and power of the Spiritual world, but where the Creator will direct this help, we cannot know. Imam: Naturally. And the more you judge another person, the more you condemn yourself. As it is said, every human is your mirror. Do you remember the cartoon about a raccoon? He once went to the lake, pronouncing «yyyy", and was afraid of his reflection, he saw the monster there. And his mother told him to go and smile at the reflection. He went, smiled at the reflection and the reflection smiled him. Maxim: Soviet cartoons are just lovely! Imam: Here it is. That is what was cultivated. Imam: Good human relations were cultivated from childhood. Julia: There is such an interesting point, when I interacted with people, they do not understand how it is possible today to talk about the union, if there are, I'm sorry, murderers, thieves, pedophiles, and such like, they kill and you want to be friends with these people? What argument can be provided to such people, I do not have words to convince them? Imam: Who brings up these people? Is not it a society that creates them, is it? Julia: They are ready to kill bad people first, in order to live well later on. Imam: So, let us take the statistics and analyze. The more we talk about drug addicts and others, the more they are shown by mass media, the more negative information is splashed on the screen and print media, and the more such manifestations appear. Sergey: Because we notice them and strengthen? Imam: Yes, we strengthen. We give our attention to it. Look what is happening, why do these maniacs appear, why all these murderers appear? Imam: On the one hand. And why a human becomes like this? Roman: The information space, which is full of negative? Imam: The human starts to think hard about it, and creates a bunch of information - a demon that starts to direct him. And he goes and does what he most often thinks about. Here is a society, here is the mass media ..., And then we say, that we have so much manifested. And where did it come from? And let us talk about the good, let's talk about the best, let's talk about conscience, honor, dignity, love of one's neighbor. Roman: To choose positive thoughts. Imam: That is right. In other words, which information field we create, in that one we mature. What kind of conditions are created for this person, those ones he chooses. If dignity, honor and conscience are cultivated in a human from childhood, then he will grow up accordingly to this. Roman: And where is the way out? Imam: After all, let us form the positive by ourselves. Roman: Do we have to start with oneself? Roman: Do you mean healthy members of the society? Imam: Yes. They understand that each person feels that he does something not right when behaves in a wrong way. If he does what is right, he feels comfortable, he feels an inner rise, a spiritual peace, spiritual forces appear, and he starts to create something good. Imam: Life cannot bring some despondency, unhappiness, some weeping, sorrows, and such like, as it is not a life but suffering. Roman: Here is suffering, and "there" will be suffering. What is the sense? Imam: Of course! Similar things attract similar things. It is exactly what we are talking. Let us bring up children. Oleg: I have noticed that it is hard for a human to see the best in people all the time. How can an ordinary person who does not know anything about the spirituality can see the best in killer or the best in maniac? Imam: But I wonder why he is looking at there? Roman: When a person starts to look inward and finds a contact with the soul, then bad habits and hatred and an interest in the negative television are eliminated, in addition there is another interesting moment - lie exposes, it is hard to deceive a human when he is in feelings. It is also, by the way, one of the advantages of the true spirituality. Maxim: We have come to the fact that the first thing that a human should realize - is the purity of personal thoughts. Roman: The purity of thoughts, an understanding that he does have the soul and understanding what the soul is. And that there is either a consciousness, a demonic, diabolical system, or a deepest feeling, a contact with God. There is an animal side and there is a spiritual side. Again, the feeling - is a spiritual side, the consciousness -is the animal side and nothing else. To conclude, people are deeply mistaken in the belief that spirituality includes going to the church, appealing to God from the mind, rituals, baptisms, icons, pilgrimages and so on. It does not bring a human closer to God, but it only can be done through a direct appeal to the soul, ability to feel and nurturing deepest feelings. Maxim: We are all believers, we all go to church, know how to cross ourselves, but when it comes to the first commandment, people are either completely unaware, or inventively do not mention: " 'Love the Lord your God ..."
Roman: The first commandment, I also was confused when was asked. Maxim: And no one tells. And if you ask a question: how do you understand it? Roman: Yes, that is the interesting point. The first commandment of God. Sergey: And what is the first commandment? Roman: One more unaware! "Love the Lord your God with all your heart and with your entire mind." Sergey: Igor Mikhailovich said, "God is one." Imam: Because it is the first surah in the Quran. Roman: Well, after all, how to turn people from the consciousness to the true spirituality? 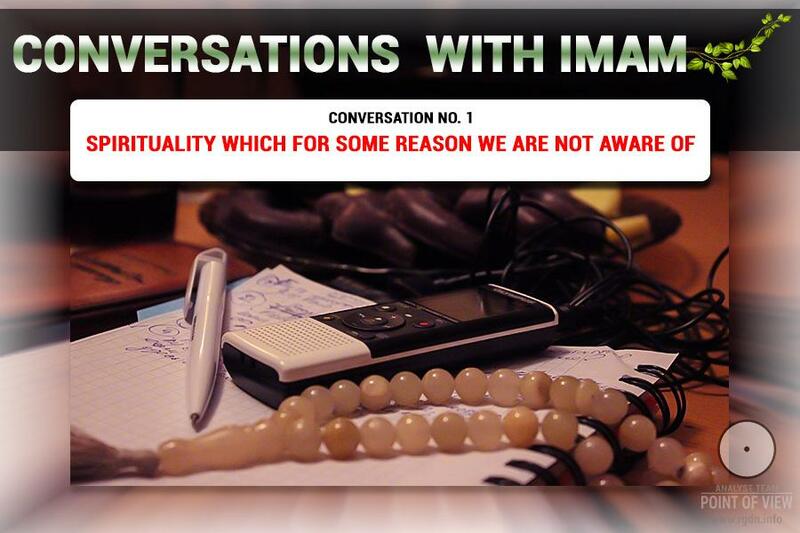 Imam: The true spirituality and true faith do not come for no particular reason. It is an internal movement of the human. Roman: Is it the result of some work? Imam: This is the result of inner work, but it is not a work, which is done with a great effort, it is not in external, although a human after receiving the information, starts to look into the internal, personal feelings, own spiritual movement. What can I give God? Yes. Here is the understanding that the whole world is created by Him – that is without doubt. What can I give him? For some reason everyone comes and says, "Give, give, give ..."
Roman: Or "I will build a new temple for God." But does He need it? Roman: Or you take a jar of jam from the owner's storeroom and offer it back to the owner? Imam: Yes, you take from him something that is made by him and offer it back, saying in addition, "I donate it to you, give me more." Imam: At the minimum, it is unnatural, as everything here belongs to Him. Roman: Well, yes. But people do not understand it for some reason. Imam: What can we give Him except our love and our gratitude? For that, even though temporary, but very valuable life. Roman: One more component of true spirituality is gratitude, is not it? Imam: When we have the same approach. We did feel the unity with our loved ones in the childhood, unrequited love, based on nothing. Why this love is true? Because it does not require anything for itself. It is not concentrated on anything. It is impersonal. It just exists. These are inner feelings. It does not rely on anything external. And when we talk about the fact that human should love God. And why? Yes, because he has given us so much! But should we return Him at least a droplet of something? To return that love that He gives us. In this, in fact, a contact occurs. God is Love, and when we have it, then we are with Him and He is in us. We are in Love, Love is in us - that is the contact. That is the true spirituality. Roman: Not to beat bows through fault and sorrow? Maxim: Everything goes right. When you come to see someone, live in his house, what can you give in return? Love and gratitude. This means, thank you very much. It is clear for the consciousness. Sergey: I liked it very much when we first met with the supporters of Krishnaism and they brought an analogy with the apartment. Imagine that you come to someone else's apartment, and say, listen; I do not like that a vase and a sofa are there. I want to change everything here. And you start changing, despite the fact that the owner does not understand what is happening. You change, change and change, and then you say- listen, host, and are you here in general? Roman: And that you are not fair somehow and I have many questions to you (laughter), in Posner's program many people expressed so. Imam: Claims. I wonder when children make us claims, what do we tell them? In fact, a smart parent gives the child, not what he wants but what he needs. But we are in our pride think that someone owes us something. That God owes us something. But does not he give us according to our faith and what is really needed, so that we would eventually mature and grow out of these mortal pants? Roman: With regard to the same problem situations, they appear to be necessary. Imam: Naturally, by our choice, and then start to shift responsibility on to someone else. Then we again run to Him and say, "Give me! Solve my problems"! Wait, but who has created them? If you have unleashed something bad in this world - tie it. Bring yourself back to the state from which you came. Do you have a tranquility, a state of inner unity? Get it back. It is in your power. Any situation that is given to a human means that a power is given to solve it. The world exists in accordance with these laws. There is a situation - there is a power to resolve it. So, just take a step on your own. You understand how easy it is solved. Roman: So, to generalize once again, the real power of the spirituality is the deepest feelings, love and gratitude to God ... and the rest is from the evil one. Is that right? Imam: Yes. Namely the feeling, it is always in purity. In the purity of intentions. It is not colored by any desires. There is a purity, the purity of intentions. You do not need anything. Roman: It is not colored by any interest. Imam: That is right. Love is something that is not colored by any desires. Neither fleshly desires nor some expectations, as if you will be given something for this. You are doing it so much in purity, so much in deepest state of inner purity, love and the state of full effect. We cannot give him anything else except love. We cannot give him anything except internal that we have found in ourselves, something that is not connected with this material world. Maxim: As long as a human will be looking for in an external, he will have problems, dissatisfaction and bad situations. Maxim: When he learns to switch over to the internal, to the spiritual component, he will see true himself and feel God. He will understand on what he used to spend his attention before, on the external, where everything was an illusion. Imam: Here we started our conversation about schools, church schools, but why has the change occurred? Because knowledge has disappeared, and the one what we have now, is simply distorted. If there were the Knowledge and a human received it from childhood, the Knowledge about spiritual, the Knowledge about Love, because in childhood the children are in feelings, they still remember the state in which they were. They still remember the feelings of the spiritual world. It is much easier for them to perceive that knowledge and that love and to acquire this true spirituality is much easier. Give them a chance, give them direction, and give them a goal. What God is like, how to come to Him? And for us it will be much easier. The child will grow with the inner spiritual core; he will estimate the world from this position and will act in the right way. And he does not get into situations, because there is a law under which he lives. Conscience, honor, dignity, the movement to the spiritual. He has a direction where to move. After all, people have set material goals for themselves that is why they are dissatisfied. When he gained the knowledge from the childhood, but, in principle, at any age, but when he has a goal where to go, then he has something to live for. Then there is an incentive to life, and he stars learning to live, not to die. We read the books by Anastasia Novykh, we watched the programs, "A frank dialogue about the most important things" (from 20.08.2015), "The Meaning of Life - Immortality" (from 09.07.2015), "Unity" (from 09.28.2015), so we have that understanding we are talking about. And right now in the society there is a widespread attitude that it is essential for a human to quickly implement all the patterns, imposed by this society and to die, so then, somewhere there, beyond the grave to gain some kind of eternal life. But he must learn to live here. Maxim: The knowledge that was taught in church and parish schools, in the officers corps 60-100 years ago, like to live in honor, we may say, that this is a manifestation of conscience? Imam: What does the conscience mean? It is just a deepest moral law, according to which a person measures one’s acts; this is the law of the spiritual world. It is a feeling, first of all. This is the first thing a human relies on in his actions. He does something and he feels whether he is doing it right or not, if he obeys the divine laws or not. If he does not obey, then he feels remorse and discomfort. But doing the right thing he feels an inner satisfaction. He does the right thing; he does it not for himself. He gives; he acts for the good of others. He feels satisfaction, he is happy. This is an internal quality, an inner feeling, first of all. Roman: Is it a catalyst? Imam: As mark if I am doing the right thing. It is the same as navigator. If I go the right way, then I feel comfortable. If I depart from this rule, retreat from the spiritual path, it immediately will have an effect. We should listen to only conscience. He should live according to the conscience. Yes, the conscience says in low tones. But if we listen to, that is all the time our attention is focused on the internal state, on the inner feelings, then we will understand how to act properly. Well, how much more comfortable to live when you are on good terms with the person! When you have nothing to share with him, when you are ready to help him at any time and he lives exactly the same way. Well, what kind of society we can build! In case, we will live in this way. Well, how much more comfortable together, when everyone contributes to the extent possible. One contributes the work, the other one- finances, the third one contributes some skills, knowledge, and it all together, and everyone shares with others. Everyone is happy. Imam: Yes, in the first place. If all these people, everyone has its own qualities, everyone has its own abilities and they all strive for the same, have one goal and are united in the aspiration for spiritual, then they have nothing to share. There is no need to fight for dominance. Everyone has one goal - the spiritual. Love is present in everybody. It is impossible for conflicts to arouse among them. And it is really possible to build such a society. Imam: And it was once! Why do not we revive it? We have everything for this. We just can start to live and to interact in this way. We will acquire many friends, many opportunities to help each other. And all the questions will disappear. Roman: We get satisfaction, comfort and most importantly, eternal life! Imam: That is what we are talking about; the goal of each person is life eternal. It is life in the Spirit. We are in three-dimensionality now, our bodies are in three-dimensionality, and therefore there is dissatisfaction, because this is not life yet. This is a temporary existence in the struggle for some resources. So I am sorry, but what kind of struggle can be? If a person starts to find in oneself eternal life now, then, of course, he peacefully goes into another world without fear; he clearly understands where he is going, and what awaits him there. Roman: Well, let us complete our conversation, shall we? 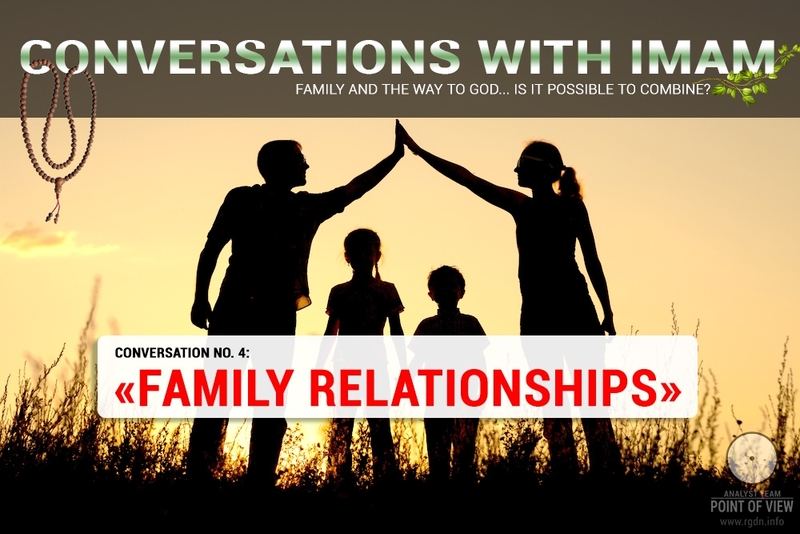 Thank God, we will have more than one conversation. Imam: There are a lot of topics. One of them is the fear of death. Roman: Spiritual Practices, attention, the voice in the head, four aspects, work on oneself, "Lotus Flower” and finally, the salvation of the Soul! It would be desirable to raise this topic globally because no one says anything about it, anywhere, somehow. Imam: And what about the books by Anastasia Novykh, "AllatRa", for example. Roman: Yes, but apart from "AllatRa" it is practically impossible to find anything anywhere. Let us start to talk about it first. And we will see then. I agree, also the issue of death is always relevant. Imam: For everybody. It does not make any difference who you are, politician, financier or hairdresser ... The issue of death, of suicide. Listen, you were given a car to ride for a while, but you took it and broke. What will the owner tell you? Roman: Thank you very much for agreeing to come, for the appointment and for the interview! Roman: Well then, as it is said, see you soon? Many thanks to all involved in the meeting, and in particular, Eva Kim, Julia Matveeva and Denis, carried out the operational translation of audio into text format. Conversations with Imam. Conversation No. 2: "The doomsday approach. The importance of human unity"